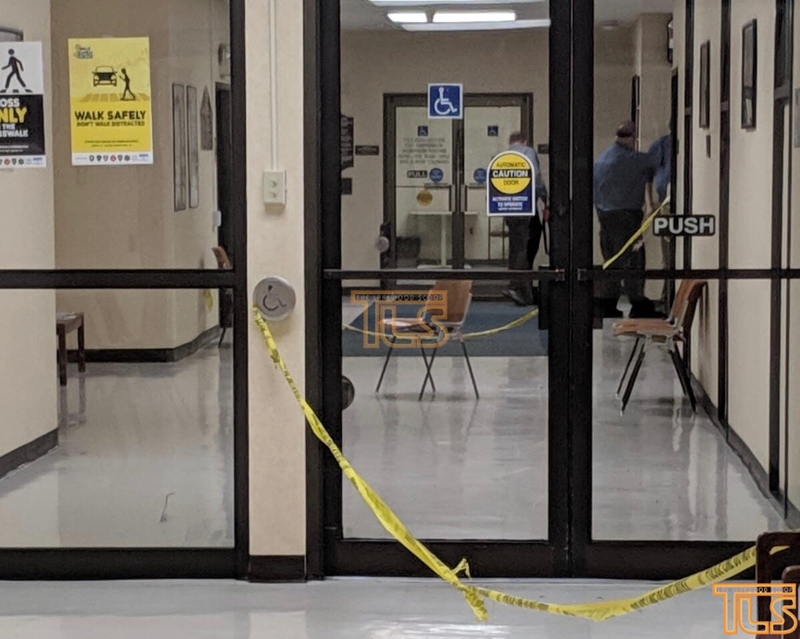 A man has been stabbed inside Lakewood’s Municipal Building, officials confirmed to TLS. According to preliminary reports, officials say a man emerged from the elevator on the second floor, and proceeded to stab a man – reportedly in the neck. Both the suspect and victim were reportedly civilians, and no Township officials were involved. The victim, a Jewish male, was treated on scene by Hatzolah, and then transported by paramedics to Jersey Shore University Medical Center. His condition was unknown. The suspect, described as a black male, was taken into custody. Within moments of the altercation, “Officers learned that the suspect had stabbed an unknown victim with the recovered knife,” Staffordsmith says. The victim is not believed to have sustained life-threatening injuries. 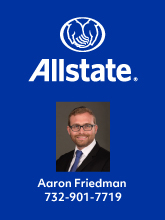 “Although we believe that the suspect attacked alone in, what appears to be a random attack, the investigation is ongoing and additional information will be released as it becomes available,” police said. 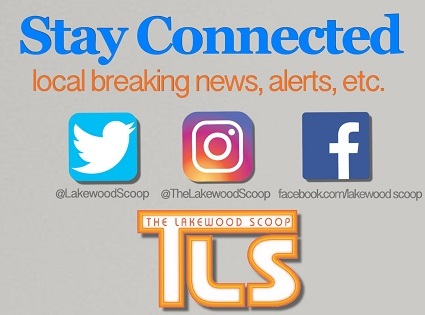 UPDATE: A man who was in the building at the time tells TLS he heard screaming, and then saw multiple officers rush to the scene. 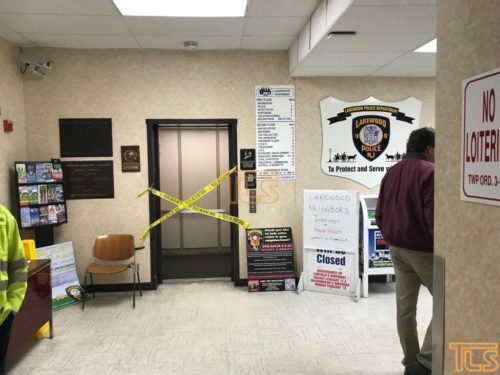 According to another source at Town Hall, a Township employee heard the screaming, and ran into the hallway, at which point the suspect appeared to have hid the knife. UPDATE: Sources tell TLS the victim was stabbed multiple times in the neck, head area. The suspect was possibly an EDP (Emotionally Disturbed Person). UPDATE: An official tells TLS the victim is 68 years old. 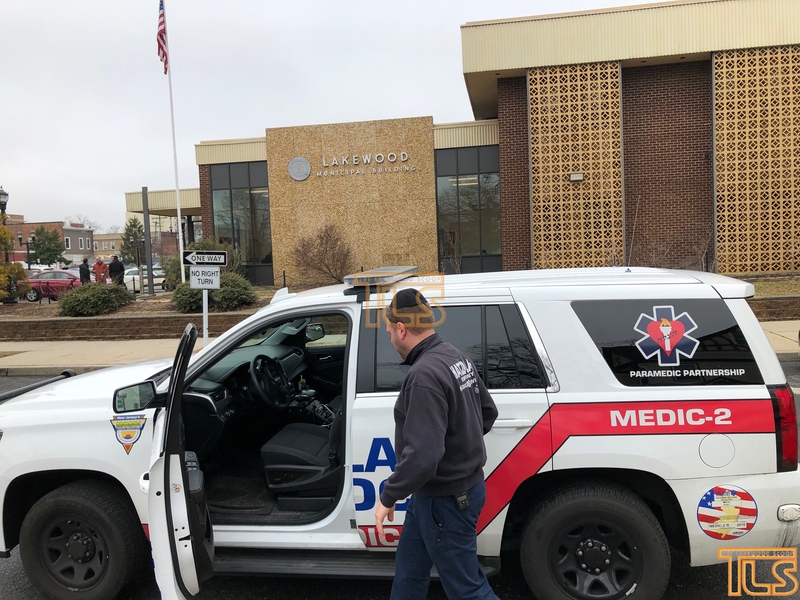 There are 14 Comments to "BREAKING – FIRST REPORT: Person stabbed inside Lakewood’s Municipal, Police Building; (VIDEO & PHOTOS) [UPDATED]"
What’s the name of the victim? Was this a premeditated hit job? Maybe this is the suspect Toms River PD is looking for. This doesnt sound loke a random attack it sounds like he was targeted. Now the real question is why and will we ever find out? It was random. The suspect is a homeless disturbed individual. What about this story “sounds like he was targeted”? What indications are there? What are you trying to insinuate? Is there a name for Tehilim? Um, you guys may wanna watch the video of Meir Lichtenstein asking people, JUST LIKE YOU, NOT TO JUMP TO CONCLUSIONS ABOUT MOTIVE. And here you are, mere moments later assuming this guy was targeted. And maybe it was rte-planned. Planned by a disturbed homeless guy. There is only one commenter (“Random? ?”) who is suggesting that this was targeted. One other commenter (“Joey”) simply asked. So please don’t make it seem like everyone on here is assuming he was targeted. Yikes. Was in just that exact spot yesterday afternoon with my kids. Refuah Shileima to the injured man!